The next set of clues used for depth perception are binocular. These are very much more accurate than the monocular clues. Related to accommodation is convergence, this is the feedback from the muscles controlling our eyes as they look at the same object. Like accommodation it is only useful for objects up to around three metres (twelve feet) away. Retinal disparity is the main binocular depth perception clue. Our eyes are around six cm (one and a half inches) apart from each other and because of this, each sees a slightly different view of an object. Our brain is able to combine these two separate images and combine them into a single 3D image. As it does this, it can also extract depth perception clues. The brain is so good at doing this that it can create 3D images where none exist. This is the basis of single image random dot stereograms (SIRDS). The images our brain receives from our eyes are very slightly different. The closer the images are to another the nearer the object they are looking at is. SIRDS make use of this by repeating a pattern of dots, but although the pattern may look the same, there are subtle differences in them. For areas of the 3D image that appear closer to the observer, the dots are very slightly closer together. (Thomas, 2001) Because SIRDS are designed for eyes that are placed horizontally as soon as the image is turned even a few degrees then the 3D image disappears. There are two ways to look at these images and that is to focus the eyes either beyond the images or to go "crosseyed" and to focus them in front of it. If you've never seen these images before one of the easiest ways to see them is to get really close to the image and slowly move your head back whilst trying not to change the focus of your eyes. Technically speaking, what you are trying to do is to loose the correlation between convergence and accommodation of the eyes. SIRDS use stereopsis to produce the image. That is, each eye sees a slightly different version of the world and the brain interpolates these images producing a 3D representation of the world around us. SIRDS are basically a series of repeating strips of random dots, but there are subtle differences in the strips where the 3D image occurs. The SIRDS above is a simple cone shape looked at from above. Consider the background plane that is not part of the cone. You can see it is made up a repeating pattern of dots. There is a prominent series of yellow dots running horizontally across the centre of this strip. They are equidistant, during the stereopsis process this is seen as a flat plane. Now consider a similar strip taken from a series that runs through near the top of cone. The series of dots have been adjusted slightly. There is a prominent grouping of blue/green dots running horizontally in the centre of the strip. They are closer together in the centre of the strip, during stereopsis these dots are interpolated as being closer to the viewer. It is the difference in the spacing of the series of dots that produce the 3D image, not the pattern of dots themselves. This may be best illustrated by using a SIRTS, Single Image Random Text Stereogram. These are also known as ASCII Stereograms. When you view this as a 3D image, you'll find that each different line of words is on a different plane. This is solely due to the spacing between the words. Using this information other SIRTS can be created. Fusion occurs when the images from the eyes are combined into a single image. Sometimes the combined image perceived by the brain is so ambiguous that the brain can not decide which is in error, and so it oscillates between the two images received from the eyes in what is known as Retinal Rivalry. This ambiguity is used in a great many optical illusions, and is why many of these illusions are so confusing. Some of these illusions are designed to contain more than one image, so one person may see one thing and someone else will see a completely different image. At first glance the above image looks as though as it may exist as real objects, indeed parts of it can. By splitting the image this becomes obvious. What happens is that the eyes focus on one part of the image and that is perceived as part of a representation of a "real" 3D object. The confusion arises because although we know that it is just a flat image the brain is still trying to do what evolution has conditioned it to do, and that is create a 3D world for us. Hint: The old hag is looking from right to left, the white triangular shape, bottom centre, is her chin. 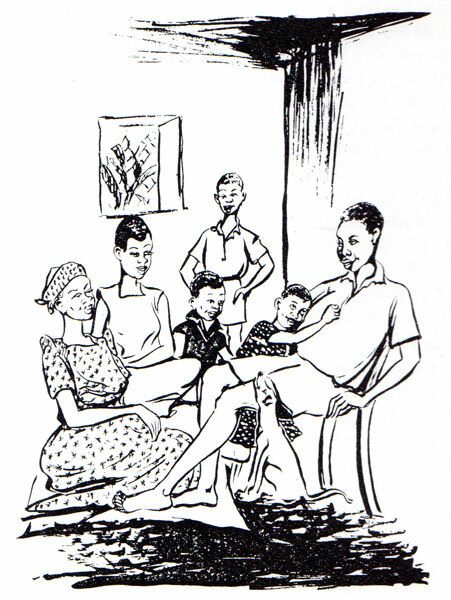 The young woman is looking away from us; the white triangle is now her chest. There are two images contained in this picture. 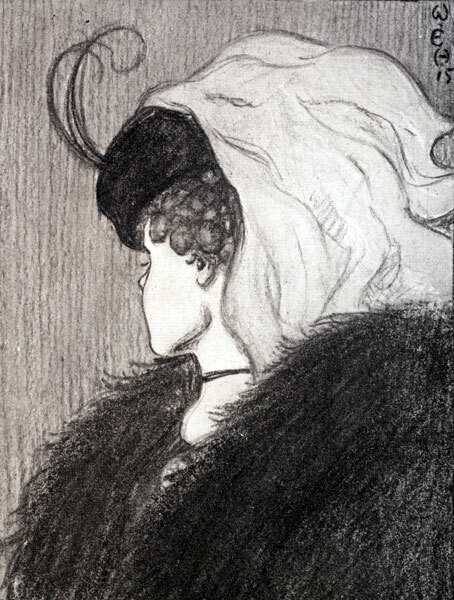 At first most people can see either the "wife" or the "mother-in-law" but once both have been seen and recognized then most people can swap what image they see at will. There are cultural differences as well in the way that things are seen. People from several countries where shown the following image. People from Est Africa tended to see this as this as a family group in which a young woman is carrying a four-gallon tin on her head. This is not an uncommon occurance in that part of the world. Westerners tend to see the "tin" as a window; something they are more familir with. The same with the following image. 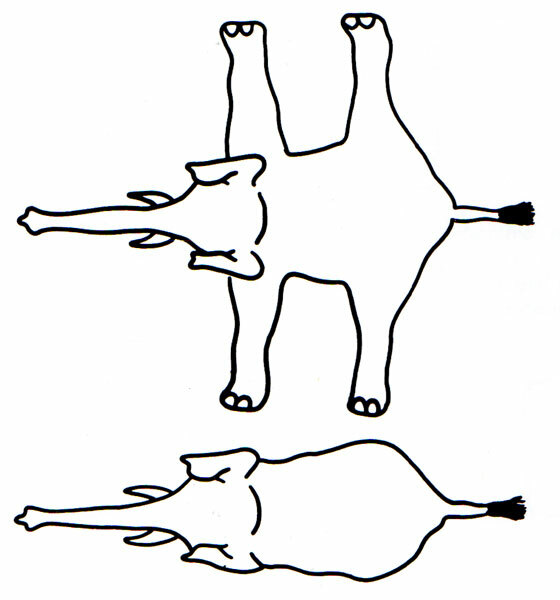 In this case the East Africans preferred the top view, and Westerners preferred the bottom one. Children of all cultures preferred the top view which is the way many of them draw objects themselves (Deregowski, 1973). Gibson, J. J. (1950), The perception of the visual world. New York: Houghton Mifflin. Gregory. R. L. (1970), The Intelligent Eye. London: Weidenfeld & Nicolson. Wallach, H. (1948), Brightness Constancy and the Nature of Achromatic Colors, Journal of Experimental Psychology 1948, 38:310-324. How visual images are perceived is a fascinating subject, the following publications and web sites are the ones this author has collected over the last 15 years and provide information and entertainment on all aspects of perception. They are interdisciplinary and can be found under such headings as Psychology, Art, Humor and even Children’s Literature. Cole, Alison, (1993). Eyewitness Art – Perspective, London: Dorling Kindersley / National Gallery – The mechanics of perspective and how it is used in art. Ernst, Bruno, (1985). The Magic Mirror of M. C. Escher, Diss: Tarquin – The life and art of M. C. Escher. Ernst, Bruno, (1992). Optical Illusions, Koln: Taschen – An introduction to the psychology of image perception. Gregory, Richard. L. (1976). Eye and Brain – The Psychology of Seeing, New York: World University Library – One of the standards of the biology and psychology of perception. Gregory, Richard. L. (1997). Mirrors in Mind, New York: W. H. Freeman / Spektrum – The psychology of perception with special emphasis on mirrors. Gregory, Richard. L. & Gombrich, E. H. (1980). Illusion in Nature and Art, London: Gerald Duckworth – The biology and psychology of perception. Kremer, John, (1992). Turntable Illusions, Fairfield, IA: Open Horizons – A collection of optical illusions with an explanation of how they work. Krantz, John H. Vision and Art. (2003) http://krantzj.hanover.edu/Krantz/art/ - The psychology of perception. A site with many interactive tutorials and examples. IllusionWorks, (2002), You Won’t Believe Your Eyes!- Mind-Bending Illusions, Dayton OH: Mead – A collection of 365 illusions and puzzles in calendar format. O’Neill, Catherine, (1987), You Won’t Believe Your Eyes! Washington D. C: National Geographic Society – An introduction to the biology and psychology of optical perception. Perceptual Science Group, MIT, http://persci.mit.edu/ - Research into human visual perception, machine vision, and image processing. Thomas, Ray, (1995 – 2003), Optical Illusions, http://www.brisray.com/optill/oind.htm - An online collection of optical illusions, with a section of how faces can be seen in nature. 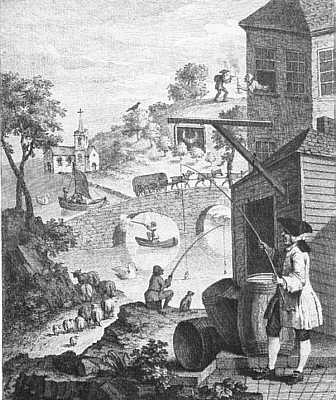 Thomson, David, (1993), Visual Magic, London: John Murray – A collection of optical illusions and puzzles. Piattelli-Palmarini, Massimo, (1994). Inevitable Illusions – How Mistakes of Reason Rule our Minds, New York: John Wiley – The psychology of perception, reasoning and memory and the errors in all three that an individual is subject to. Rock, Irvine, (1984). Perception, New York: Scientific American Library – The psychology of perception. Wade, Nicholas, (1992). Visual Allusions – Pictures of Perception, London: Lawrence Erlbaum Associates – The psychology of perception.